The EMNES Advisory Committee is composed of invited senior economists and international experts. The role of the Advisory Committee is to bring new ideas and research topics, to enhance the scope and the quality of the EMNES research and to help review the output based on your area of expertise. University’s John F. Kennedy School of Government, a non-resident fellow at the Brookings Institution, an external research associate at the University of Oxford, a resource person for the African Economic Research Consortium and a research fellow at the Economic Research Forum. Mr. Arezki is the author and co-author of numerous academic journal publications and other publications, including the Quarterly Journal of Economics, the World Bank Economic Review, the Economic Journal, the Journal of International Economics, the Journal of Development Economics and Economic Policy. Mr. Arezki’s research covers a wide array of topics energy and the environment, the macro-development resource rich countries, institutions, human capital, innovation and economic growth. Mr. Arezki is the co-editor, and co-author of four books including Beyond the Curse: Policies to Harness the Power of Natural Resources, Commodity Price Volatility and Inclusive Growth in Low-Income Countries, Shifting Commodity Markets in a Globalized World, and Coping with the Climate Crisis: Mitigation Policies and Global Coordination (forthcoming). Many of Mr. Arezki’s research papers have been cited extensively in academic circles and in prominent media outlets such as the Economist, the Financial Times, the New York Times, the Wall Street Journal, Project Syndicate, and the Washington Post. His blog posts including on the recent oil price collapse and its global economic consequences have been viewed over hundred thousand times and have been listed as the most read IMF blog posts three years in a row. Mr. Arezki is also a frequent contributor to Finance and Development magazine, VoxEU, an associate editor of the Revue d’Economie du Développement and was until recently the Editor of the IMF Research Bulletin. the board of the Tunisian Caisse de Dépôt et de Consignation (CDC) that he founded in 2011; and as an independent member of the national joint committee in charge of supervising the reform of the financial system, and the restructuring of public banks. Mr. Ayed set-up a technology group in 2012 (the Vega-Group of Companies) to empower about 70 young Tunisian graduates and young professionals, many of them unemployed at the time, engaging them in IT career opportunities. In January 2011, Mr Ayed was appointed Minister of Finance of Tunisia and served in the two interim governments following the Tunisian revolution. During his tenure at the Ministry of Finance, Mr. Ayed supervised the preparation of the five-year Economic & Social Development Program (the “Jasmin Plan”) that was submitted to the G8 as part of the Deauville Partnership Agreement. He also served as Tunisia’s Sherpa for the G8 meetings. During his tenure at the Ministry of Finance Mr. Ayed initiated several important regulatory reforms such as those pertaining to Micro-finance and Private Equity. In 1998 Ayed joined the Moroccan BMCE Group. He created BMCE Capital, the investment banking arm of the group, as a center of competency and bearer of a new culture. In 2000 he set up CapialInvest, the leading private equity firm in Morocco. In 2002 He was appointed Board Member and General Manager of BMCE Bank, and President of the Executive Committee of BMCE Group. He initiated the African strategy of BMCE making it one of the leading financial power houses in the continent with a presence in more than 22 countries. He also created BMCE International, a London based investment bank wholly dedicated to the African continent. Mr Ayed held several other senior positions in FinanceCom, the Group’s holding company, including, but not limited to, Vice-Chairman of the supervisory Board of RMA Watanya, the largest insurance company in Morocco at the time; Director of Bank of Africa, and Chairman of the Board of Axis Capital, Tunis. During his 18-year career with Citibank (1980-1998) Mr Ayed held various country management positions in the emerging countries of North Africa and the Middle East, and as Senior Banker in the Capital Markets Group at Citicorp International Plc.in London. In 1988, Mr. Ayed was appointed Corporate Bank Head of the UAE and Oman. In 1990 he was appointed Country Corporate Officer In Morocco as well as Director and General Manager of Citibank Maghreb, a Citibank subsidiary. Mr. Ayed joined Citibank Tunis in 1980. In 1986 he was promoted to Vice President of Citibank/Citicorp. Mr. Ayed joined Citibank Capital Markets Group in London in late 1995 as Senior Banker in charge of Euromarket syndicated loan activities for France and Greece. He also supervised the structuring of several large syndicated loans in the MENA region. Mr. Ayed was awarded the Order of the Tunisian Republic in December 2011. He was granted the ‘Distinguished Alumni Award for Leadership & Ingenuity’ by Citibank New York in May 2014. During his professional career, Mr. Ayed has had extensive contacts and recurring working relationships. major international financial institutions and development agencies such as the World Bank, IFC, ADB, FMO, ACTIS, KfW, AFD as well as several other organizations. He served as Director in the Board of PROPARCO, the French Development agency from 2007 to 2010. Mr. Ayed chaired the Moroccan U.S. Chamber of Commerce (1992-1995), and was elected its Honorary Chairman. He was also an active member of the U.S.-Morocco Council. He co-founded, and still is, Vice President of Euromed Capital Forum, an organization aimed at promoting the private equity industry in the Mediterranean region. In December 2013 he was appointed Chairman of MED Confederation, a Brussels based non-profit organization aimed at fostering socio-economic cooperation between the northern and southern shores of the Mediterranean. 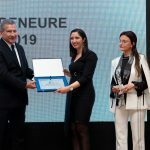 He is the Honorary Chairman of Carthage Business Angels’ Association and an active member in several other civil society organizations in Tunisia. He is particularly involved in promoting programs aimed at fostering youth employability and entrepreneurship. He obtained a Masters’ degree in Economics at the University of Maryland in 1979 where he was elected member of the prestigious Phi Kappa Phi Honor Society for academic distinction. His academic curriculum includes credits obtained at the University of Colorado (1977) and the University of Florida (1978). Mr. Ayed is a renowned composer of classical music. His works include piano compositions and symphonic works that were performed in Casablanca, Tunis, and Washington. His music was performed at the Carthage Music Festival (2009) and at the El-Jem Classical Music Festival (2009 & 2014). He regularly organizes concerts in Tunisia for the benefit of charitable organizations. He is an avid golfer, and a fervent reader. He is married with three children. Institute’s external training program for officials from member countries. Most recently, he was Assistant Director and Division Chief in the Middle East and Central Asia Department where he oversaw surveillance and program work on fragile states: Egypt, Libya, Somalia, Sudan, South Sudan, and Yemen, and was Mission Chief for Libya and Somalia. He is the recipient of the 2014 IMF Operational Excellence Award for his work on Libya. Previously, he was the Chief of the Regional Studies Division, where he oversaw regional surveillance of 32 countries in the Middle East, North Africa and Central Asia regions, and the production of the Regional Economic Outlook. Prior to that, he was the Chief of the Middle Eastern Division of the IMF Institute where he oversaw capacity development in that region. He joined the IMF in 1999. From 1991 till 1999, he was on the faculty of Finance in the Department of Finance, University of Notre Dame in Indiana. He also served as a consultant to the World Bank, and to the private sector in the US. Ralph Chami has a BS from the American University of Beirut, an MBA in Finance and Statistics from the University of Kansas, and a Ph.D. in Economics from the Johns Hopkins University. His areas of specialization are: banking regulation and supervision, financial markets, and remittances. His hobbies include music and yoga. Ralph was a semi- professional guitarist for over 40 years https://www.youtube.com/user/MusicRC99. 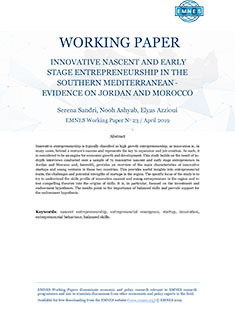 and understanding of the functioning of the informal economy, as well as the conception and implementation of time use surveys and gender indices at regional and national levels, especially in the MENA region and in sub-Saharan Africa. Iinvestment and private sector development between MENA and OECD countries. During this period, the MENA Initiative has introduced the process of OECD peer review in the MENA region, supported processes of reform at the national level and conducted capacity building activities. Carlos Conde is also responsible for the collaboration with South Africa as key partner of the OECD. Prior to his current position, Carlos Conde was deputy Head of Division at the Governance Reviews and Partnerships Division of the Public Governance Directorate of the OECD, leading the work of the MENA-OECD Governance programme and promoting the collaboration with Latin American countries. Before joining the OECD, Mr. Conde was associate professor of political science and public policy at the University of Granada in Spain. 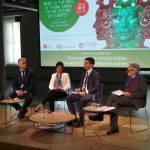 In this position, Mr. Conde led several projects of academic co-operation, research and network building between Arab and European universities. Mr. Conde had visiting positions at the University of Harvard (1995-96) and Al Akhawayn University of Morocco, where he lectured between 2001 and 2003. Mr. Conde holds a PhD in Political Science and Public Administration from the Complutense University of Madrid. Pantheon Sorbonne in 1984. Professor El Khawaga received the state encouragement award in Economics in 1996 for two of her published research. She has also published extensively on macroeconomics and labor economics both locally and internationally in Arabic, English, and French. She was a member of Shura council from 2001 until 2011 and currently she is a board member of Central Bank of Egypt as well as the Egyptian banking Institute. Economics at FEPS. She was also an Assistant to Cairo University President for Research and External Relations since September 2013. Dr. Hala serves as a member of the board of directors of the Central Bank of Egypt and Egypt’s National Post Authority. In addition to her membership in many research centers like Center for Economic and Financial Research and Studies and Cairo Demographic Center. She is also a member of board of trustees of International Business Driving License (IBDL). Dr. El Said has a leading role in public service as she is an active member of Qalaa Holdings Scholarship Foundation. She has been also a member of some NGOs as Egypt@Work Advisory Committee- Nahdet El Mahrousa, “Our Children Our Future” Foundation and MENA Consultative Group to Assist the Poor (CGAP) at World Bank. She has authored several research papers and articles covering financial sector, international finance, financial markets, access to finance and economic reform. Dr. El Said holds a PhD with honor from the Faculty of Economics & Political Science at Cairo University. diverse fields, including First Assistant to the Minister of Trade and Industry since July 2004, as well as board member of multiple institutions and committees, including the Egyptian Telecommunication Regulatory Authority (ETRA), the Egyptian Institute of Directors (EIoD), the Egyptian Competition Authority (ECA), the Egyptian Bank for Exports Development ,the National Council for Women, and the General Authority For Investment. 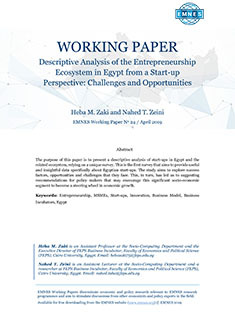 A Professor of Economics at Cairo University as well as Deputy Director of the Egyptian Center for Economic Studies (ECES), a leading public policy think, Dr. Fawzy is an active contributor to the field of economic research within Egypt and the Middle East and North Africa region as a whole. She has published extensively on various topics, including; trade, industrial economics, investment theories, multi-national corporations and corporate governance. Dr. Fawzy received her Ph.D in Economics from Cairo University in 1984. She is married with two daughters, four granddaughters and a grandson. Associate Dean at the University of Tunis, Al Manar, and Visiting Professor at Sorbonne University and Nice Sophia-Antipolis University in France. He is also a Research Fellow and former Board member of the Economic Research Forum for Arab countries, and former Board member of the MENA Health Policy Forum. He has also been member of the Tunisian Socio-Economic Council and Consultant to international institutions such as the World Bank and UNDP. His research and publications have focused on macroeconomic, international trade and competition issues in MENA countries. Dr. Lahouel holds a PhD in Economics from Harvard University. economic international relations, in particular with regard to Euro-Mediterranean issues. He started working in the banking sector as representative of the Banque Commerciale du Maroc in Milan (Italy). His career within the Moroccan administration was then marked by his active role in the negotiations of free trade agreements with the European Union, the United States, and several Arab and African countries. From 1999 onwards, he has held senior positions within the Moroccan Ministry of Foreign Affairs: Director of Multilateral Cooperation (1999-2001), Director of European Affairs and Ambassador to the Barcelona Euro-Mediterranean Process (2001-2003). In 2003, he was appointed Ambassador to the European Union (2003-2004) and later to France (2005-2009). In 2009, he becomes CEO of the Moroccan Investment Development Agency, leading its launch and subsequent growth. Fathallah Sijilmassi is an officer of the Légion d´honneur and grand officer in the Ordre National du Mérite of the Republic of France. He is a graduate in Political Science, holds a PhD in Economics and speaks five languages: Arabic, French, English, Italian and Spanish.